I love this rice pudding recipe. It is rich and creamy and scented with lovely cinnamon. The raisins are optional. Leave them out if you don’t like raisins. They are one of my favorite things so I love them in a rice pudding like this. I would actually add more raisins, but suit your own taste buds. Wash the rice in running water until the water is clear. Put it in a bowl with enough hot water to cover and leave it to soak for 15 minutes. Drain the rice and put in a heavy-bottomed pot with the water and salt. Cover the pot, bring the water to a boil and cook the rice on low heat until the water has been absorbed. Stir the sugar and half of the cinnamon into the cooked rice. Add the milk and mix well. Cook, uncovered, over a low heat until most of the milk has been absorbed. Stir the rice pudding occasionally. 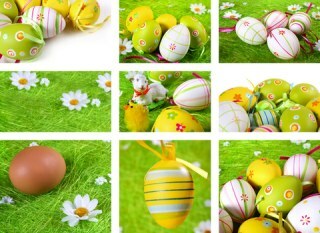 Lightly beat the eggs and very gradually mix them into the rice. Continue to cook the rice pudding for 5 more minutes. Stir in the raisins and turn the rice pudding into a serving dish. Sprinkle the extra cinnamon over the pudding. 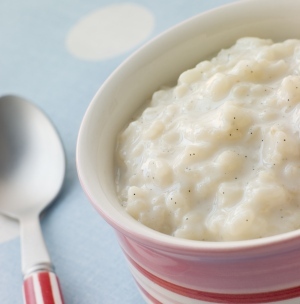 This rice pudding recipe is fabulous served either warm or cold. Sprinkle each serving with extra cinnamon if you wish and top it with a bit of whipped cream for an extra creamy treat. Some people think they hate rice pudding because they associate it with that glop you sometimes get in diner type restaurants. 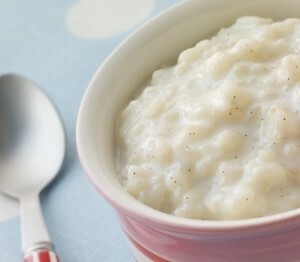 Real rice pudding is rich, creamy and delicious. Not a cinnamon fan? No problem. Replace the cinnamon called for in the recipe with grated nutmeg. I would use a bit less nutmeg as I find it much stronger than cinnamon, but suit yourself. You can also use a mix of 1/2 a teaspoon of cinnamon and 1/2 a teaspoon of nutmeg. If you like this recipe, I’d love you to Pin it to Pinterest, Tweet about it, Like it on Facebook and add your own delicious recipes below. Look here if you would prefer a baked rice pudding recipe.